Herein, we demonstrate that a homogeneous catalyst can be prepared continuously via reaction with a packed-bed of a catalyst precursor. Specifically, we perform continuous proline catalyzed α-aminoxylations using a packed-bed of L-proline. The system relies on a multistep sequence in which an aldehyde and thiourea additive are passed through a column of solid proline, presumably forming a soluble oxazolidinone intermediate. This transports a catalytic amount of proline from the packed-bed into the reactor coil for subsequent combination with a solution of nitrosobenzene, affording the desired optically active α-aminooxy alcohol after reduction. To our knowledge, this is the first example in which a homogeneous catalyst is produced continuously using a packed-bed. 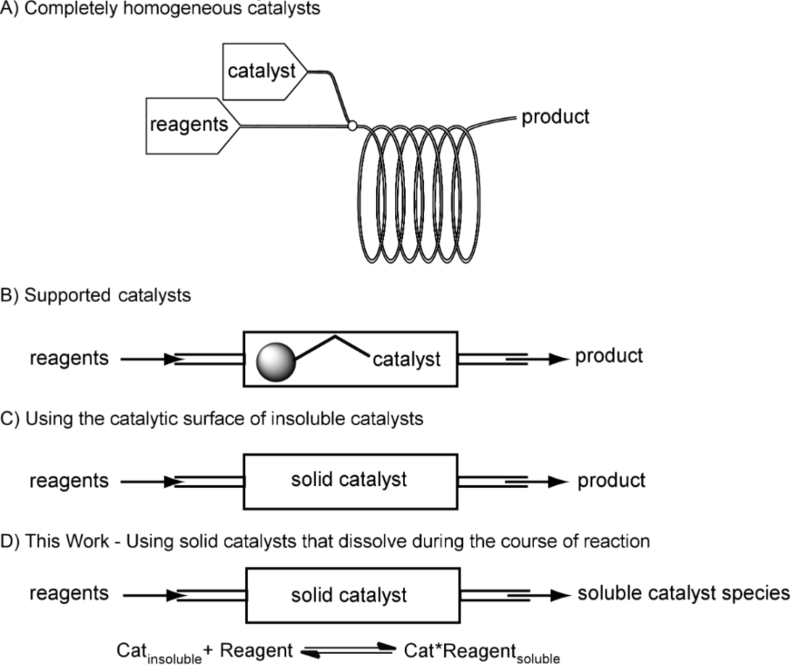 We predict that the method will not only be useful for other L-proline catalyzed reactions, but we also foresee that it could be used to produce other catalytic species in flow.